Showing your guests a unique experience is one of the bonuses to hosting a wedding. Your save the date card is the first impression your guests will receive, and making a lasting impression starts with the first piece of mail. Making your destination wedding card feel like the start of a fun adventure is the goal. When your guests realize a vacation is on the horizon an excited momentum for your destination wedding will be created. 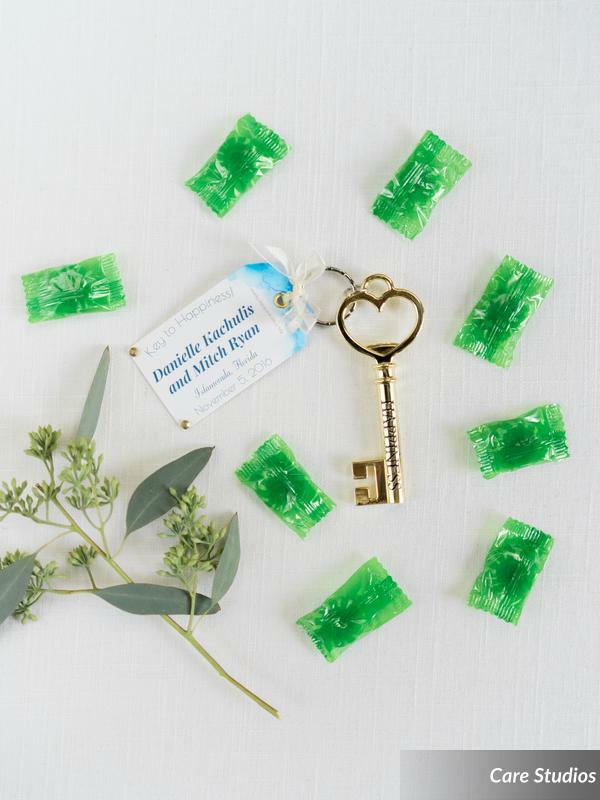 Common Florida Keys travel themed save the dates would include a boarding pass in a ticket sleeve, or a gold key accompanied by key lime candies. 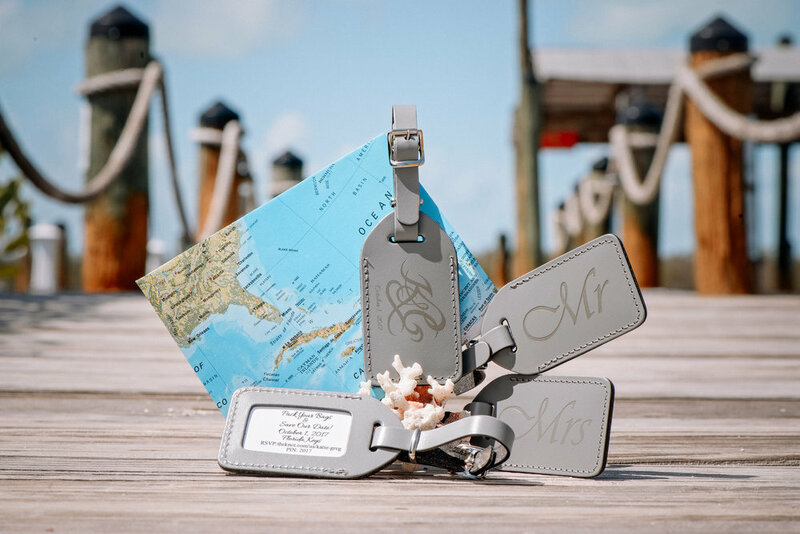 A leather luggage tag save the date placed in a map lined box, or something beach themed is a perfect way to encourage guests to begin making their vacation plans. Using your engagement photos as a post card is a great destination save the date idea. All of these ideas can be carried throughout the wedding theme. If you used a luggage tag save the date you can do a boarding pass seating chart. Or if you used a key charm save the date you can incorporate keys into the place settings and with in the overall design. Your engagement photos can be printed and placed throughout the reception area to further personalize your wedding and the list goes on. To be more specific, your save the date will include basic information of your wedding like your names, the date and wedding location. The location of the venue doesn’t have to named on the save date, just the area. So if you are getting married at a resort in Key Largo, you can simply put Save The Date, Jan 19 2018, Key Largo. One of the most important pieces of information to include would be your wedding website. The wedding website will be made right after you have secured room blocks for you guests. This is the place that guests will go to start planning their trip and having a clear indication of how to do that should be on the website. Things like transportation companies, directions from the airport, activities to do while down there, places to eat, places to shop, spas, babysitting services, events you may be planning outside of the wedding as well. The website is a work in progress so don’t worry if its not complete by the time you you’re your save the dates out. Just get the accommodations and a basic list of things to see and do before sending out your save the dates. 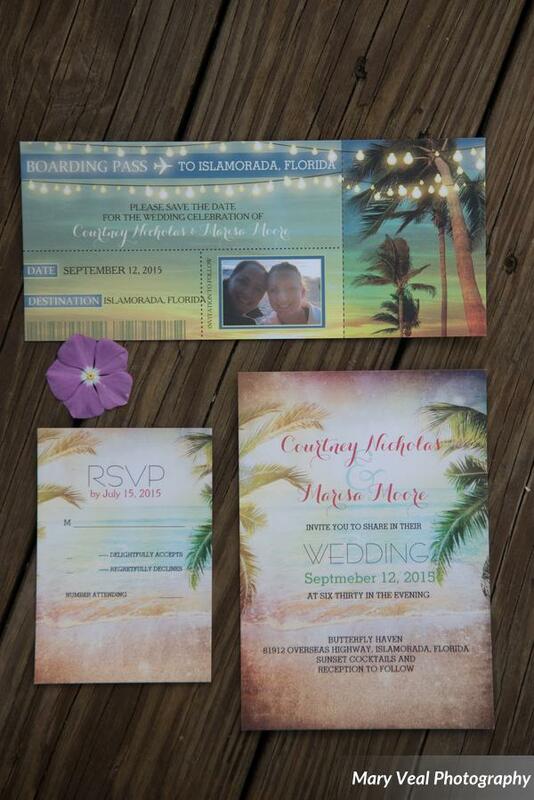 Since your destination wedding invitation goes out about 3 months before, allowing your guests to get a head start in planning their trip is important. Your website can also allow your guests to rsvp even before they get the invitation which is always great for planning. Try to also infuse your color palette in your travel theme save the dates, as this will give your wedding guests another clue to the feel you are going for. If you are going for a formal setting, your save the date would have a more modern tone to it, usually encompassing more shades than colors. And visa versa. If you don’t know what colors you are going for, using an engagement photo is a great way to avoid having to choose a theme. The budget should be taken into consideration, as there are so many things to consider investing in. You want your save the date to make an impression right away, but if you want to invest in a band with the ultimate lighting package, then consider doing something fun, but low key. Marianne, the brides mother found these key bottle opener keepsakes at a local Florida Keys Shop. She loved the gold and thought it would be a fun surprise for guests to receive these in a box, lined with a picture of the bride and groom that had the date and location on it. The box also contained their favorite florida keys key lime candy. 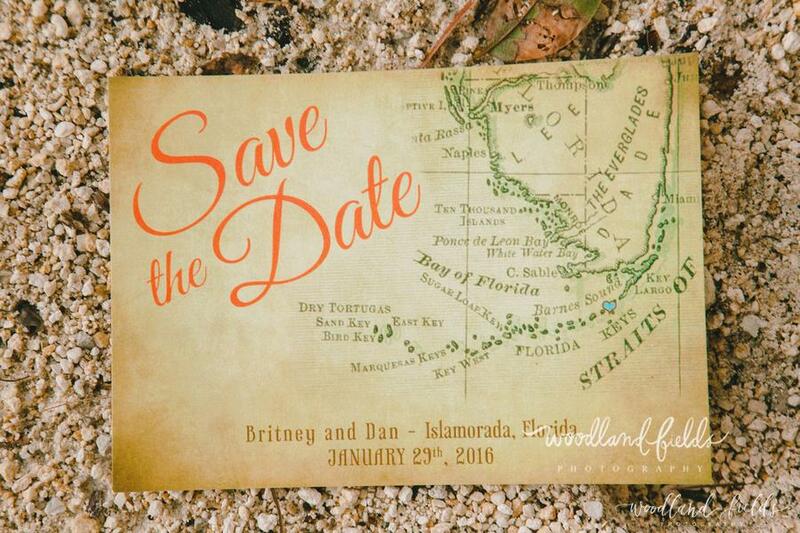 Brittany and Dan used a post card save the date and placed a heart on the exact location on the map where they will be tying the knot. So cute! Katie and Greg had a strict budget but found this great vendor who made these leather save the dates that were sent in a box with a post card of a map of the keys. Katie found a local lady to engrave them for her. They said Pack your Bags & Save our Date. The date, the location and the website. Great job Katie! These fun boarding pass save the dates followed by their destination wedding invite let guests know how fun and laid back the wedding would be. It was a such a beautiful night! Here at Blue Water Weddings we help guide our wedding couples so their guests have an experience to remember from start to finish. We know how important your dream wedding is, and bringing two families together to help create those memories with you is our true purpose and drive. Florida Keys Weddings. The Why.